The Dutch began to colonize Indonesia in the early 17th century; the islands were occupied by Japan from 1942 to 1945. Indonesia declared its independence after Japan's surrender, but it required four years of intermittent negotiations, recurring hostilities, and UN mediation before the Netherlands agreed to relinquish its colony. Indonesia is the world's largest archipelagic state and home to the world's largest Muslim population. Current issues include: alleviating poverty, preventing terrorism, consolidating democracy after four decades of authoritarianism, implementing financial sector reforms, stemming corruption, and holding the military and police accountable for human rights violations. Indonesia was the nation worst hit by the December 2004 tsunami, which particularly affected Aceh province causing over 100,000 deaths and over $4 billion in damage. An additional earthquake in March 2005 created heavy destruction on the island of Nias. Reconstruction in these areas may take up to a decade. In 2005, Indonesia reached a historic peace agreement with armed separatists in Aceh, but it continues to face a low intensity separatist guerilla movement in Papua. 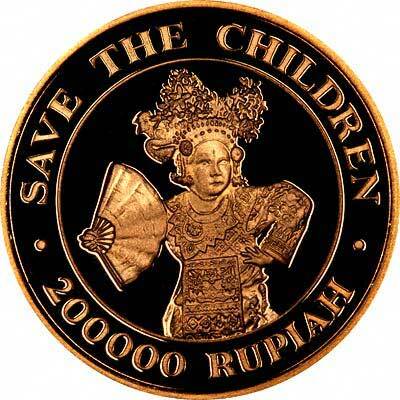 Indonesia only isued its own coins for the first time in 1970, and its gold coins are commemorative pieces. Please telephone for current prices and availability. For silver and base metal coins of Indonesia, please look at our original Chard Coins website. 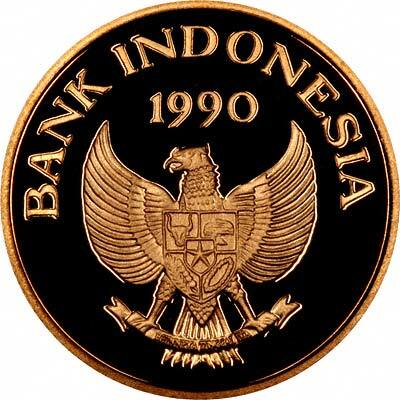 We make an active market in almost all world coins, gold or otherwise, including Indonesian gold coins. If you have any of these coins to sell, please contact us, or post them to us for appraisal and offer.